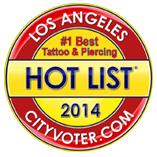 At North Hollywood Tattoo our crew of tattoo artists and piercers are skilled craftsmen. They take pride in translating whatever you have in your imagination into a tattoo or piercing that reflects your personality and sense of style. Our responsibility is to provide our customers with the very best tattooing and piercing experience possible. All crew are CAL O.S.H.A Bloodborne Pathogens certified and licensed by the Los Angeles Health Dept. People come into North Hollywood Tattoo happy, and leave even happier. Seeing our customers, our living canvases, walk away happy with their tattoos and experience forever changed in a positive way is one of the perks of working at Studio City Tattoo. We invite you to browse throughout artist’s portfolios and bios.